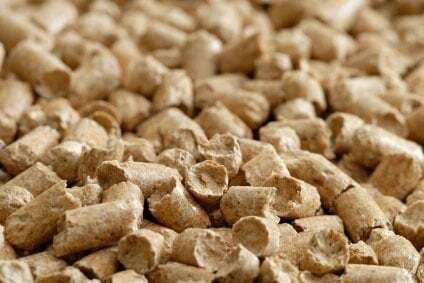 US forest industry performance in November and December was recently reported by both the US government and the Institute for Supply Management. Total industrial production (IP) rose 0.6 percent in November (+3.9 percent YoY) after a downward revision (from +0.1 percent to -0.2 percent) to October’s reading. Manufacturing production was unchanged (excluding autos: -0.1 percent), mining output increased 1.7 percent, and the index for utilities gained 3.3 percent. The full report on November’s new orders was not published because of the partial government shutdown. However, a preliminary estimate of business investment spending (-0.6 percent MoM; +6.6 percent YoY) was provided in the Census Bureau’s advance report on durable goods orders. “The third decline in four months for business-equipment orders may add to concern… that corporate investment and factory activity are at risk of slipping into a more pronounced slowdown,” wrote Bloomberg’s Sho Chandra. 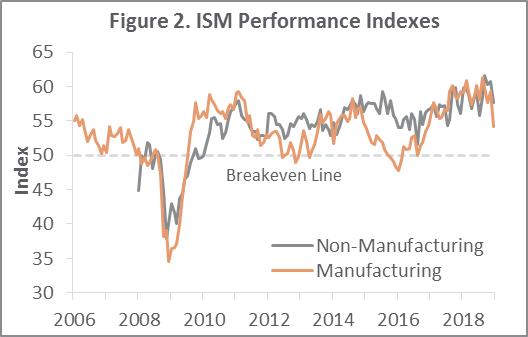 The Institute for Supply Management’s (ISM) monthly sentiment survey showed that in December the expansion in US manufacturing decelerated (-5.2PP, the steepest drop in over a decade) to 54.1 percent (Figure 2). The pace of growth in the non-manufacturing sector also lost some momentum (-3.1PP, to 57.6 percent). There was little indication in the data of trade issues weighing on business; export orders accelerated while imports eased only slightly (Table 4). The consumer price index (CPI) was unchanged (+2.2 percent YoY) in November, as a 4.2 percent decline in the gasoline index offset increases in an array of indexes including shelter (+0.3 percent) and used cars and trucks (+2.4 percent). The all items less food and energy index increased 0.2 percent (+2.2 percent YoY). The producer price index (PPI) edged up 0.1 percent (+2.5 percent YoY). A 0.3 percent increase in prices for final demand services (led by fuels and lubricants retailing: +25.9 percent) offset a 0.4 percent decrease in the index for final demand goods (especially gasoline: -14.0 percent).